Some of the artists who arrive to participate in our Artist-in-Residence program have a very clear idea of what they want to accomplish, while others approach their residency as a time for experimentation and change. When Pamela Vander Zwan came to participate in the program she was looking to stretch out and shift gears. Since the mid 1980s Vander Zwan has created photo-based installations. Her work is often composed of multiple panels of individual images sometimes spilling off the wall into three-dimensional space. So like a set designer or architect she begins her process of creation with a rough sketch in a notebook. The sketches help Vander Zwan pre-visualize the combination of appropriated and created images that she uses in her installations, and they also serve to collect her ideas that accumulate as notes across the space of the page. While in Syracuse Vander Zwan started on a new body of work titled the Parmelian Series. As far as she can tell the word Parmelian was invented by Jean Chambers Moore a publisher and dealer of art books. In 1926 Chambers Moore published a portfolio of Ansel Adams' photographs titled High Sierra. Because she didn't think that she would be able to sell the work as photographs she renamed them Parmelian Prints in an attempt to appeal to collectors of art. This deception and its reference to the history of photography appealed to Vander Zwan as she began to formulate ideas for new work that would examine the role of propaganda in corporate and military structures. 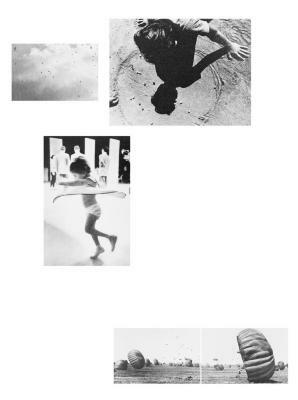 In the piece titled Newspeak, Twirling Girl, Paratrooper Vander Zwan juxtaposes images of idealism, vulnerability, and force. In one panel a young girl is pictured twirling in a moment of innocence and joy, in another a young boy studies a game of marbles, contemplating his next move. Off to the left a picture of clouds becomes the backdrop for a pack of vultures, and located at the bottom of the installation are two panels containing pictures of invading paratroopers who have swept in, presumably to save the day. Using only the selection and positioning of images Vander Zwan is able to convey the complex suggestion that idealism is only a myth simultaneously kept in check by pessimism and the use of force. Corporate culture is the subject of two of Vander Zwan's installations titled Employee, Pinch Bug and Screaming Man, Whispering Man. In Employee Pinch Bug she places framed portraits of faceless people above an image of a pinch bug that is being probed as it lies helpless in a matchbox. The framed portraits are captioned with brass plaques identifying them as 'employees.' At onetime they might have been employees of the month, but now corporate downsizing has left most workers glad just to have any job. For Vander Zwan the myth of the contented worker is as foreign an idea as the environment of a matchbox is to a bug. Screaming Man, Whispering Man looks at the corporate structure as a system that shines the light of success on a small group of select individuals that can walk on water when compared to the rest of the workers who are located somewhere further down the line. In all three installations, which Vander Zwan still considers opening statements to a larger body of work, there is an elegant frustration that attempts to look through the prevailing rosy picture of peace and prosperity to expose the ongoing patterns of corporate exploitation, and with few exceptions, its general lack of concern for human welfare. Just like the twirling girl we may be in a period of carefree optimism, but in Vander Zwan's work she cautions that when the twirling of the economy stops and the arguments begin the corporate and military vultures will be hovering once again.